While I enjoyed my reading of The Fire and The Cloud by David Bigman, I must admit to feeling a bit out-of-place as a non-Jewish reader. Much of this book was over my head in some respects due to not understanding a lot about the Torah. I still recommend this book to both Jewish and non-Jewish alike, simply realize that if you are not familiar with the Torah, it may be a bit puzzling to understand at times. I only got about ½ of the way through, and that’s after about a year of reading this, as I kept going back to reread portions. This is not the fault of Mr. Bigman, but rather my lack of knowledge about the Torah and other aspects. I fully intend to continue in my reading and research so that I shall be able to read it with a more comprehensive understanding. On a rating scale, based on what I have read, I give this book a **** rating. I can foresee when I have finished it finally that it will support that same rating. I received my copy of this book from Gefen Publishing House in exchange for an honest review. My experience with reading Butterfly Swords was pure pleasure. From the first page to the last, I was captivated and intrigued. Set during the Tang dynasty, China, 8th Century, Ai Li is the only daughter of the Empor who was thrust on the throne, and not being born to it. Raised a princess, her grandmother taught her to use “8 chop swords”. which Ms. Lin refers to as Butterfly Swords in both the title and the book. 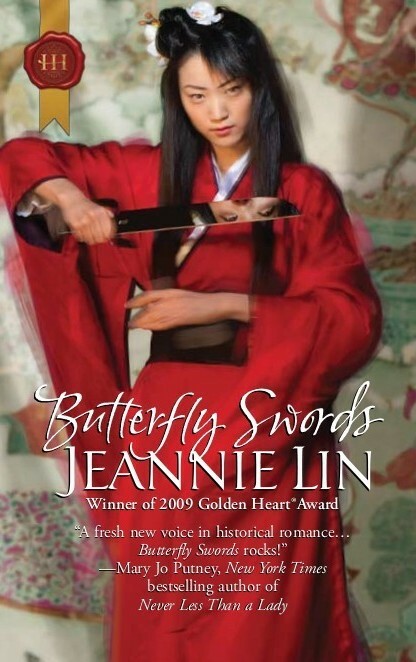 Ms. Lin chose to use this name and not the name used by the Chinese because of the hard/soft aspect of the sound of it, and, the romantic and action-like connotations that the name Butterfly Swords depicts of the Asian setting and time. Ai Li has been transported to meet her as yet unseen husband to be, when she discovers he is responsible for her Fourth Brother’s death. Unable to bear the thought of being with this monster, as she sees him, she flees with the help of a trusted supporter. Along the way, she meets a golden-haired barbarian, a foreigner to the Empire. Ryam has been in the Empire for some time, fighting and living with a band of brothers, so to speak. His best friend is married to the former Empress of the Empire, who fled the throne, leaving Ai Li’s father the new Empor. He has been battle-scarred, is tired and hungry when we meet him. He is struggling with the deaths of the men intrusted to him by his friend, and commander. Ryam spots Ai Li, who has fled her betrothed, Li Taos,, due to his duplicity and is dressed as a young man in disguise. Our hero sees through this disguise and is amused that she seems somehow able to pull it off. Ai Li spots the hungry “White Demon” as her people call him and offers him her bowl of rice which he’s been smelling all the while watching her. When her companions all begin to drop, and a band of men, most likely Li Taos, men attack her and try to take her with them, Ryam comes to her rescue with his sword and his ability to wield it. He also discovers that Ai Li is more than capable with her Butterfly Swords which she has studied with her brothers for a considerable amount of time. Ai Li and Ryam head toward Changan, the hub of the Empire her father rules. The princess proves to be not only beautiful, but strong and courageous, though at times, a bit deceptive with the hero. The two fall in love as they walk, ride, and fight their way to Ai Li’s parents home where she hopes to convince them that she cannot marry Li Taos. When things don’t go as planned, Ai Li and Ryam must decide what is most important. Honor and Loyalty, or Love? Neither believes it possible to have both. This was such an enjoyable read. Full of exotic descriptions of the “Silk Road” and the Tang dynasty era, one cannot escape the love that simmers and then boils over between Ai Li and Ryam. Throughout the book, Ryam calls our heroine Aylee, which in part helps us to understand how one would pronounce her name. This made reading Butterfly Swords just a little easier when it came to the heroine’s name. If you enjoy reading historical, like Asian culture, you’ll enjoy Ms. Lin’s debut novel, which was a 2009 Golden Heart Winner. Unlike many historical set in the Regency period, this one gives us both a beautiful and dangerous time to read about. I give this a 4 1/2 stars without a doubt. I encourage you to pick it up and read it. Like me, you’ll likely find yourself drawn to the other books since published by Ms. Lin, many of which are also set in the Tang dynasty era. As I stated earlier, I received this as a prize from a blog of writer, not Ms. Lin. I chose to read and then review it honestly.